About a hundred people were waiting for the Dalai Lama when he arrived for his first appearance in Minneapolis Friday. Many were Tibetans, including Nima Lhamo, who wore a traditional Tibetan outfit and held flowers while she stood outside the University of Minnesota's presidents' house. Lhamo said she felt like she had learned a great lesson after seeing the spiritual and political leader. "I felt like I just met my teacher or parents," Lhamo said. "He always teaches how to be a good person, how to be good to yourself and help others." 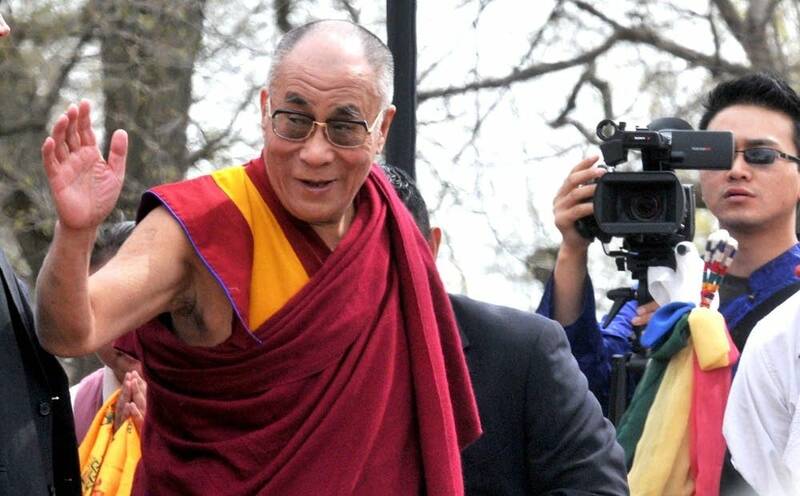 In March the Dalai Lama announced he would step down as the political head of the Tibetan government in exile in India. But even as he's continued the crusade to separate Tibet from Chinese rule, the Dalai Lama has considered himself to be in semi-retirement since 2001. The Dalai Lama's position at that time was both as Buddhist leader and as head of the Tibetan government in exile. But in 2001, at his instigation, Tibetans elected a political leader for the first time. That year Tibetan refugees from India were still settling into new homes in the Twin Cities. The community now numbers about 2,500, according to the Tibetan American Foundation of Minnesota. For the young Tibetans who grew up here, the transition to democracy for the Tibetan government in exile is a natural step. "As you can see around the world people have been fighting to get freedom, but he's giving us the power" said Tashi Dorjee, a Tibetan born in India and raised in Columbia Heights. "We just had a big election of our prime minister and since now he's done all the work and its fully established he wants to hand the power to the people." Last month Tibetans in exile elected Lobsang Sangay, a Harvard academic, to lead the government as Prime Minister. While younger Tibetans may be comfortable with the move, you hear a sense of loss from the older generation. "He's resigning this 329 years of tradition and breaking up and building a new democratic system," said Thupten Dadak, who was the Tibetan American Foundation's vice president when the Dalai Lama visited in 2001. "We have a sadness because we have a history of who the Tibetans are." That sense of ambivalence was prominent as Friday's events got started. For his part, the Dalai Lama said the Tibetan communities in Minnesota, India and elsewhere are ready for democracy. "I was always telling people that religious institution and political institution must be separate," he said. "If I truly believe separation is really important, then first, I must make separate. "That does not mean I resign from Dalai Lama-ship," he added, to laughter. The Dalai Lama said he's happy to continue as a spiritual leader. He said he's proud Tibetans in exile have been able to preserve and enjoy their culture. Thupten Dadak said every time the Dalai Lama visits, it's like a parent reaching out to steady their child. And Dadak said if the Minnesota Tibetan community was a toddler when the Dalai Lama visited in 2001, it is now at least a teenager — a teenager who is proud to be both Tibetan and American. "[Some members of the Minnesotan Tibetan community] show very, very effectively that they keep their identity and language and faith," Dadak said. "I feel confident Tibet culture and Tibetan beliefs are never going to lose." Dadak said the Dalai Lama looked younger this weekend than he did 10 years ago. Dadak said that gives him hope for all Tibetans. The Dalai Lama's visit to the Twin Cities continues Sunday with a speech at the University of Minnesota's Mariucci arena.